In front of a standing-room-only crowd of family members and teachers, students in Fulton’s Universal Pre-Kindergarten program recently delivered a holiday treat of Christmas songs. 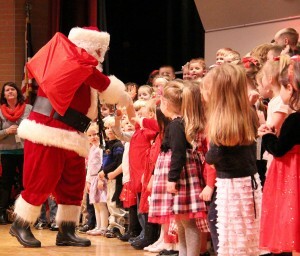 Santa stops by to greet Fulton’s Universal Pre-Kindergarten students at their recent concert. Gathered on stage, the students followed their teachers’ lead as they sang, rang bells, and made hand gestures in sync with the music. According to Carri Waloven, the Fulton City School District’s director of literacy and UPK, the annual sing-along is the perfect way to showcase how the students have developed so far this year. 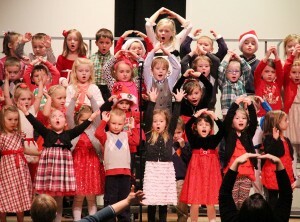 Fulton’s Universal Pre-Kindergarten students entertain a capacity crowd during a recent sing-along in the G. Ray Bodley High School auditorium. In addition to the concert, there are other events throughout the year for UPK students and their parents, Waloven said. Family Academy, Family University and a UPK science night are just a few of the items on the agenda in the coming months. Waloven noted that there are still openings available in the UPK program for this school year. Eligible participants must have turned 4 years old by Dec. 1, 2014. 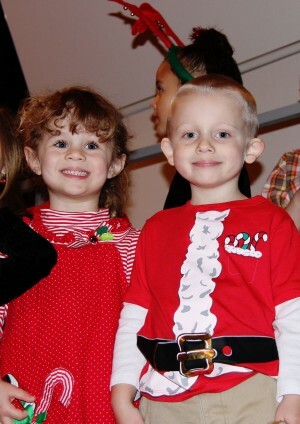 Taryn Murphy (left) and LJ Gulliame get ready to make their concert debut during Fulton’s annual universal pre-kindergarten holiday sing-along. According to Waloven, the program provides numerous opportunities for students to develop socially, emotionally and mentally. UPK also prepares students future school success by developing strong skills in early literacy and numeracy, she said.